The problems of female characters being under-represented in geek merchandise is real. But when it’s a secondary character like Gamora or Black Widow, at least toy companies have an excuse. When the girl is not just the star of the movie, but of the whole franchise, that’s another story. 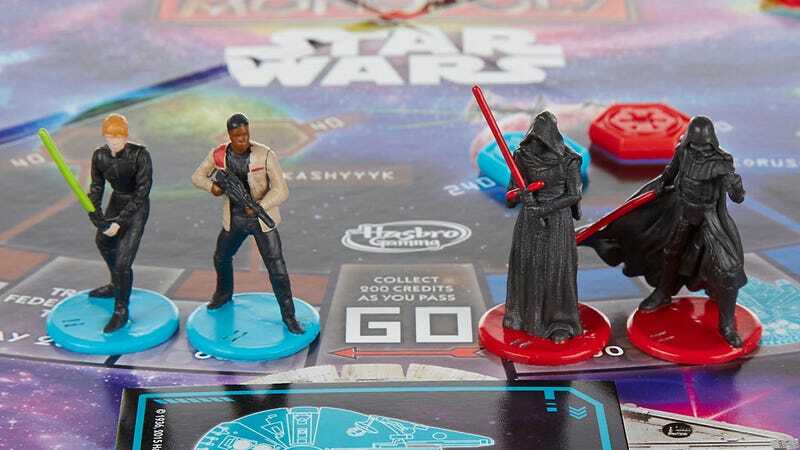 That character, of course, is Rey, the main character of Star Wars: The Force Awakens, and the latest problem has to do with Hasbro’s Star Wars: The Force Awakens Monopoly. In the game, the four playable characters are Luke Skywalker, Finn, Darth Vader and Kylo Ren. No Rey. Obviously, she should be in there instead of Finn. Not just because she’s a more important character, or a girl, but for reasons in the context of the movie as well. There are parallels with the other four characters, implicit or otherwise. I have no problem with Luke and Vader being in there if you want to pay tribute to the original trilogy but Finn over Rey seems crazy. Of course this isn’t the first time Rey has been missing from a set she obviously should be in. She wasn’t in a set of Target figures that seemed to represent the film’s main characters. It’s 2016. There’s no reason for a character like Rey, the star of Star Wars, not to be part of every single piece of merchandise possible. Everyone—not just girls—wants toys featuring this amazing character. This 8-year-old girl says it better than most.